Traditional military intelligence analysis has focussed on military sources of information such as satellite feeds, sensor data from manned and unmanned aerial vehicles and human intelligence from operatives in the field. Over the last 10 years Open Source Information Sources (OSINT), including social media sites such as Twitter & Facebook and live media streaming sites like Periscope, have become all pervasive and impossible to ignore. Effective use of OSINT adds a major capability to the UK’s military intelligence gathering capacity. However it also presents serious challenges to existing intelligence gathering approaches, which rely heavily on teams of analysts manually analysing data, in terms of the scale of information that must be checked and the real-time throughput at which hypotheses can be rigorously developed and assessed. In Intel-Analysis DSTL we are using AI techniques such as natural language processing to automatically extract relevant facts from large volumes of social media posts. High precision information extraction from natural language text is a grand challenge in computer science. We are exploring how novel Open Information Extraction (OpenIE) approaches can be best used to identify and extract key facts that intelligence analysts need to know to answer questions such as "what hotels are UK nationals using to shelter in during a crisis?" or "which evacuation routes are blocked due to social unrest?". Evidence extracted using automated fact extraction from OSINT is used in argumentation schemes alongside other sources of evidence to support teams of analysts trying to evaluate conflicting hypotheses during real-time events. Fact extraction from social media. State of the art fact extraction algorithms based on natural language processing (NLP) and open information extraction (OpenIE) techniques. These are applied to real-time social media including Twitter and Facebook posts. The aim is to extract evidence from open source intelligence suitable for use in machine reasoning via argumentation schemes. 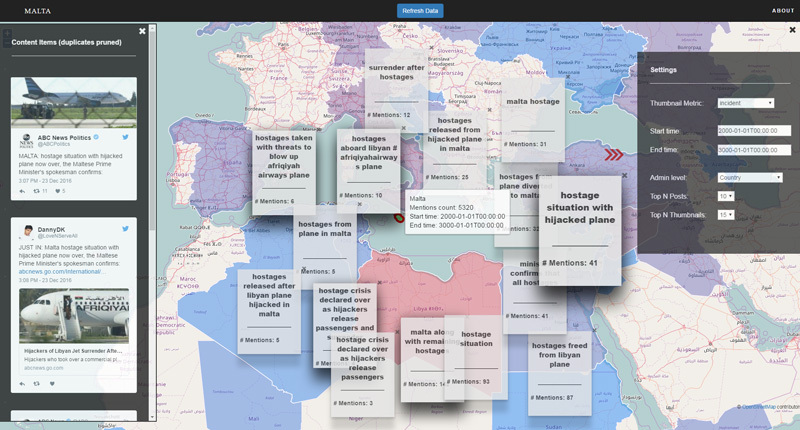 IT Innovation have developed live demo of the Journalist Decision Support System (JDSS) which includes fact extraction from breaking news events. Facts extracted and visualised from emerging news stories include incident reports, sightings of actors like gunmen, numbers of casualties and eyewitness reports. The underlying fact extraction software used in JDSS is also integrated into CISpaces. For other project demos, please see the CISpaces website. The Intel-Analysis project is a multi-stage project funded by DSTL's Defence and Security Accelerator competition. Stage one is due to finish at the end of December 2017. This project is funded by the DSTL Defence and Security Accelerator programme under agreement number ACC102157.